Hakka Bangka Cuisine Ngiong Thew Fu 酿豆腐 | Bangka Urang Kite Jitjong A.M.
Ngiong Thew Fu 酿豆腐 (Pinyin : Niang Doufu) or Yong Dou Fu or Yong Tahu is one of famous Hakka(kejia) cuisine 客家食品. This food is popular among other chinese etnic groups. In Singapore tourism guide, Hakka Yong Doufu 客家酿豆腐 is well published, together with Teo Chew Porridge and Cantonese Dimsum, as part of the singaporean must-try cuisines. Hakka People客家人 bring Ngiong Thew Fu 酿豆腐 to Bangka Island邦加岛. Hakka(kejia)客家 called themselves “Thong Ngin唐人” means People of Thong, transfer the recipe from generation to generation. Hakka People客家人 is very good in manipulating Doufu豆腐(bean curd) In 2009, China Cable Television channel 9 (CCTV 9), broadcasting Hakka(kejia) Culture in Guangdong. Focusing in a Hakka Long Wu 客家龍屋 , a Hakka(kejia) Dragon House. The housewife served the guest with a big dish of Hakka Ngiong Thew Fu 客家酿豆腐 while she was telling the history历史 behind it. Ngiong Thew Fu history酿豆腐历史 begins in the ancient days of Hakka History客家历史. It has begun when the word “hakka” is not yet used, “hakka” means “Guest Etnic Group”. It is an attribute or classification from other etnic groups. Hakka People客家人 bring Ngiong Thew Fu酿豆腐 to all the way of migration process. Its formula was transfered along their long journey, where no other etnic group in China do such migration process. See Hakka Migration Process. Wherever Hakka People客家人 live on, you can find Ngiong Thew Fu (Niang Dou Fu) Yong Doufu or Yong Tahu酿豆腐 there. Hakka(kejia)客家 is 90% of chinese population in Bangka Belitung邦加勿里洞, Indonesia印度尼西亚. So that, Ngiong Thew Fu 酿豆腐 is a kind of home cuisine. Not for sale to consumers. You can not find it in any restaurants. Ngiong Thew Fu 酿豆腐 (Pinyin : Niang Doufu) or Yong DouFu or Yong Tahu is delicious. It is not difficult to make. Basically it is Doufu豆腐(bean curd) or tahu or thewfu in a triangle form, Half slicing from the top of the triangle, then fill it with minced pork or beef with spices, after that steam it around 45minutes. Now you get a Hakka Ngiong Thew Fu客家酿豆腐. If the minced pork is replaced by fish plus some ingredients than you will get Thew Fu Kok 豆腐角 (Pinyin : Doufu Jiao) or Tahu Kok豆腐角. 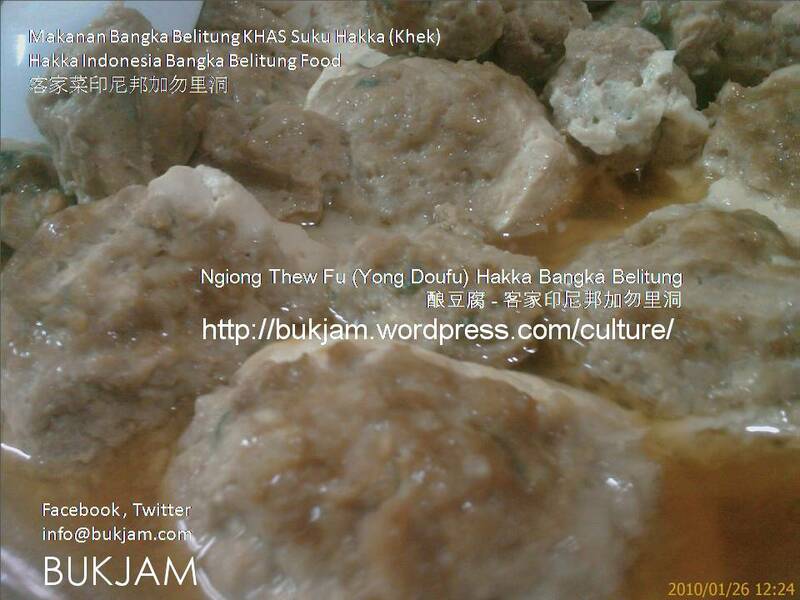 You can get Tahu Kok豆腐角 in many Bangka邦加 Restaurant or Belitung勿里洞 Restaurant in Jakarta or other cities. Ngiong Thew Fu 酿豆腐 (Pinyin : Niang Doufu) or Yong Doufu or Yong Tahu can be modified to Hakka Ngiong Khu Kwa 客家酿苦瓜 (Pinyin : Niang Ku Gua), it is also delicious and lower colesterol than Ngiong Thew Fu 酿豆腐. What is Ngiong Khu Kwa酿苦瓜 ? basically it is Ngiong Thew Fu 酿豆腐 but the subtance is bittergourd, not bean curd (doufu). See Hakka Cuisine Ngiong Khu Kwa .You must try Hakka Ngiong Thew Fu客家酿豆腐, you will never forget the taste ever after.